Kerr Pump & Supply specializes in a variety of heat exchangers, with a large inventory available to serve your needs. 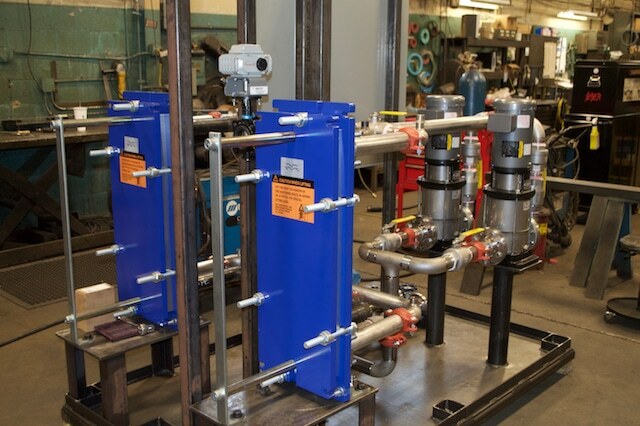 We custom build systems to include heat exchangers that are expandable. Following are the key heat exchanger categories. The plate heat exchanger has a pack of corrugated metal plates with portholes for the passage of the two fluids between which heat transfer will take place. The plates are fitted with a gasket which seals the interpolate channel and directs fluids into alternate channels. The number of plates is determined by the flow rate, physical properties of the fluids, pressure drop and temperature program. The plate corrugations promote fluid turbulence and support the plates against differential pressure. Here the plate heat exchangers have the stainless steel plates brazed which eliminates the need for gaskets and thick frame plates. Brazing material seals and holds the plates together at the contact points ensuring optimal heat transfer efficiency pressure resistance. Immersion heaters are easy to install and maintain. Designed for heating liquids and gases in tanks and pressure vessels, immersion heaters are ideal for applications requiring higher kilowatts. Immersion heaters are made with tubular elements brazed or welded to a flange. Stock heaters are equipped with a general purpose (NEMA 1) terminal enclosure. Immersion plates are a low-cost way to heat and cool tank contents. 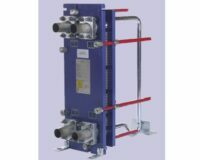 The semi welded plate exchanger is provided with gaskets specifically designed to resist aggressive media. The non-aggressive media flows in the gasketed channels. This construction means it can be dismantled easily for cleaning and inspection. 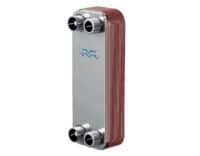 Heat exchange duties of spiral heat exchangers include: liquid/liquid heating, cooling or heat recovery, where one or both of the fluids may cause fouling. Vapor/liquid condensing, particularly at very low pressure and/or high volume flow. The design, shape and size of the spiral channels can be customized so that they are a perfect match for the demands associated with a wide range of process fluids, thermal duties and industrial applications Spiral heat exchangers only require a very small area for mounting and access, resulting in lower unit installation costs compared with other heat exchangers. The spiral heat exchanger is a very versatile product. Many of the duties performed by heat exchangers require one channel per fluid, and this can be a distinct benefit. Contains a shell with bundles of tubes inside the shell. One fluid runs through the tubes, and another fluid flows over the tubes through the shell to transfer heat between the two fluids. Alfa Laval for Plate and Frame, spiral, brazed, welded heat exchangers. Kerr Thermal for shell and tube heat exchangers – Replacement Tube bundles for all makes. Xchanger for air to air, air to liquid, tank vent condensers. Fluid Chillers Inc. for custom industrial process chillers, portable and stationary. Thermal Transfer for shell and tube heat exchangers. Delta Cooling Towers for corrosion proof cooling towers. Omega Thermal Products for clamp on, immersion coils, steam or cooling.